I was looking for a good place to eat in Knoxville. I wanted some place chef inspired, not chain inspired. So, before I left I contacted some people I know in the Knoxville area, and asked for some recommendations. There were a few lists flying around, and there were a couple that bubbled to the top. I decided on the Northshore Brasserie because it came highly recommended by the peeps, as well as most every restaurant rating site. I set out from downtown Knoxville and drove about 20 miles from downtown to this dark remote exit off of the Pellissippi Highway. There is some non-descript strip mall with a bunch of non-descript store and this restaurant, Northshore Brasserie. It does not look like much from the generic outside, but I was pleasantly surprised after walking in. There is hardwood floors, and spacious bar area, and a spacious dining area with crisp white table cloths on each table. The menu is really fun, there are daily specials made in the chef choice, there are les moules - mussels, steak frite, salads, entrees (one of each kind of meat) and desserts. The day I went, the daily special was rabbit, and the chef's preparation was in three ways. I stopped the waiter from telling me what those 3 are because I have never had a decent rabbit dish. All the rabbit I previously had were dry and stringy, and nothing like chicken. I just did not want to risk another meal of rabbit. I am sure the chef here does a really nice job every week with the rabbit, but I just think rabbit is just not for me. I stuck to my decision, and what I order was terrific! I got a small order of mussels steamed in a white wine broth, and an oyster salad with Benton's bacon lardon and grilled romaine. The mussels came in a big pot and reminded me of Brussels. The waiter was so kind to bring me some extra bread to dip in the steaming broth. I rarely get mussels anymore, so this was a treat for me. The grilled romaine salad was good too. We have grilled romaine on a very hot wood fire, and then topped the romaine with S&P, crumbled blue and a drizzle of 20 yr aged balsamic vinegar. Our romaine is a bit charry on the outside, and cool in the middle. 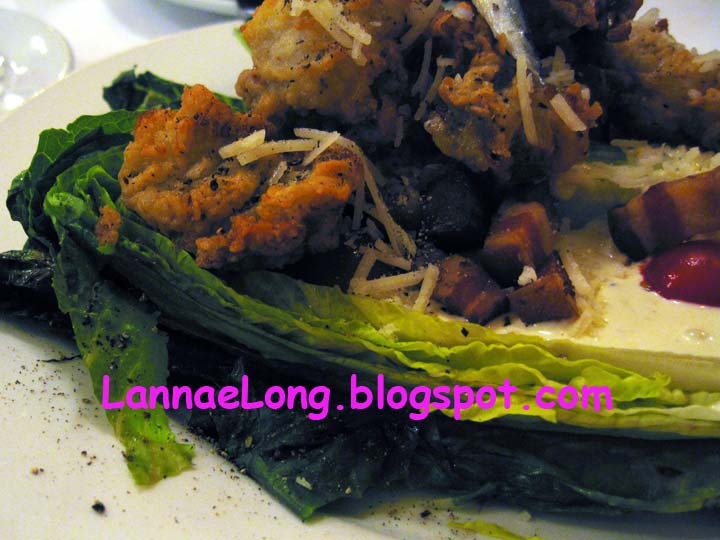 The romaine here only had the outer leaf slightly grilled, and then topped with a few fried oysters, Benton's bacon lardon, and a creamy parm dressing. I just love Benton's bacon, so how can this salad be bad? I was not going to do dessert, but the waiter conned me into beet ice cream. Of course I just love Roderick's, from Silly Goose, beet ice cream, so I indulged. 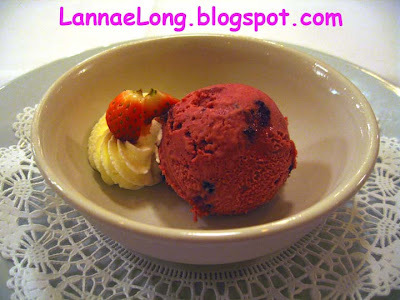 The Brasserie beet ice cream is a lovely muted plum purple color dotted with cherries. I love the little surprise of sweet and tart cherries. It is so refreshing to have a nice option with food cooked in house with many local organic base ingredients in Knoxville. There are so many chains serving industrial pre-made product in Knoxville that are ok, but nothing to blog about. It is nice to be able to go to the Brasserie and enjoy my meal prepared just for me. I was on foot, and walked around and around and around Newton Centre looking for Jake's Falafel Corner. I did not find it until I walk into the Sandwich Works deli and I saw Jake's Corner in the far left corner of the Sandwich Works Shop. So, you are warned, there is no sign for Jake's Corner, rather Jake's Corner is literally a corner of the Sandwich Work Shop. If you are walking or driving, look for the Sandwich Works Shop. Jake's came highly recommended by my Newton's friends for a meal that feels good to eat, and won't weigh you down. I got a falafel wrap with hummus, two of my favorites, and topped with every veggie Jake has. The wrap is huge, and I could not finish it. The falafels were light and crunch on the outside, and smooth on the inside. The hummus was a lovely creamy texture with a nutty and chickpea flavor. It was so good. 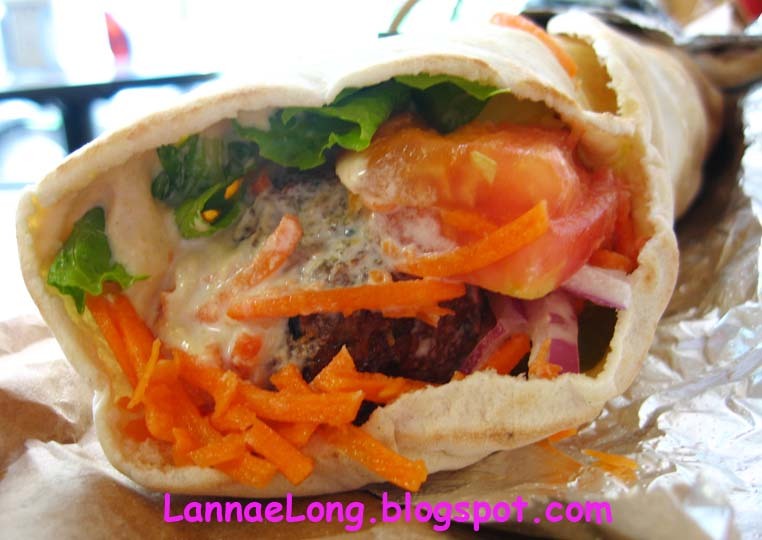 One falafel wrap was big enough to hold me through a whole day of site seeing in Newton, Brookline and Boston. What a great value. It is so dang fun to run across local people doing really cool things, like Kristin making pickled yummies! I ran across her Kickstarter page Pickle Me This, and her Facebook Page and I was intrigued. You know me, I love local and local organic ingredients, and this gal is doing just that. She picks up a lot of her fruits and veggies from the local farmers, and packs 'em into pickling jars and preserves them. How fun is that? She has one that is pickled plums. I am so anxious to try the plums! One thing that I love about Kristin's product is that the her product is shelf stable, stabilized in the old fashioned canning way (not in the yucky chemical way)! I live in a small house, I don't have a lot of freezer space, so I was considering canning as a way to preserved food for winter. Canned/jarred food can be stored under beds, under couches, in the corner of a closet without any electricity to keep it in its state stable state. I have a lot of space under the bed, just not in the freezer. Once the jar is open, the un-eaten portion can be fridged for up to a month. I love this stuff, and you might too! Go check out the Kickstarter page Pickle Me This! Hey Local Folks, remember last year, last April 2011 when an F5 tornado ripped through our neighboring state of Alabama? Well, there was a Wizard of Oz type of tornado that leveled a lot of homes and farms. Here is one example of how an F5 tornado changed the lives of some farmers and their heritage turkeys, free range chickens, pigs and cows. The humans and animals had their homes destroyed by the F5 tornado. It is time for the heritage turkeys to start nesting, and they need a home, a barn, a safe place to have their nests and eggs. You have 1 week left to help this farming family and the animals. Help them rebuild their barn and coop. We landed at 5 pm, got to the hotel at about 6 pm and we walked over to Jinpachi for sushi. Jinpachi does not have a website, so you need to be in the know. 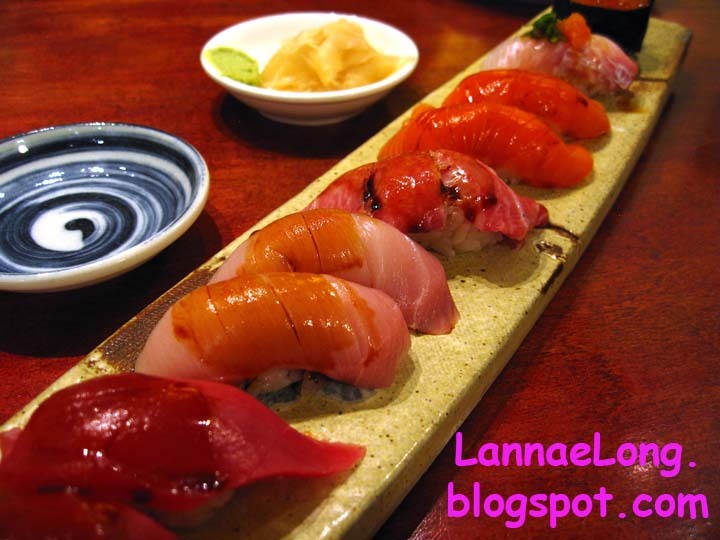 Jinpachi has been rated the best sushi in the greater L.A. area by a bunch of friends from the area. I really wanted a light dinner, and definitely no fried food. I wanted fresh and raw because it seems like every time I travel by air, I feel so unhealthy and fresh and raw foods seem to make me feel better. This trip, with a lay over around lunch time, there choices seemed to be poor quality fast food or deep fried food. We got fried chicken and soda for lunch, and it made me feel rather bad. So, when getting to L.A. I just wanted the opposite of fried chicken and nasty fructose corn syrupy. I just wanted to degrease and feel better. What better than some raw fish, fresh veggies and some nice green tea. I started off my meal with a nice cup of green tea and a salmon skin salad topped with bonito shavings. I never had salad topped with bonito before. The bonito was delightful. 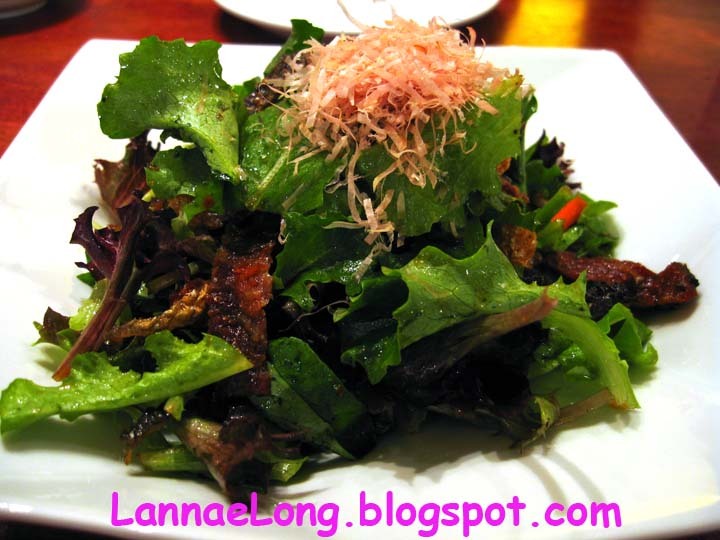 It was a very nice light and umami addition to this simple salad. We got the tuna, yellowtail, toro, salmon and salmon egg nigiri sushi. I really like that the sushi chef dressed the sushi prior to delivering the sushi to our table. He added just a light brushing of soy sauce on each piece to add the amount of soy I really always want on my sushi, not the big glob I normally get wen I accidentally drop my sushi into a dish of soy sauce. Each piece was smooth and butter and nearly melted in my mouth. This was a nice way to ease into L.A. We sat back and relaxed while eating our sushi. We felt refreshed after such a nice meal. This recipe is only good for those living in the Nashville area, or where you can get the appropriate ingredients. There are a couple ingredients that you can only get in Atlanta and Nashville, so those living in other areas, you are SOL. 1. The grilled chicken, for those who have driven down Harding Rd in the Antioch area of Nashville has seen BBQ grills rolling smoke and aroma from 369 Harding Place around the building that houses Linbar Market and San Luis meat market. The grilled chicken here is relatively inexpensive, had the right spices on it, and the right amount of grilled flavor you want. Rotisserie chicken will not do this dish justice. What you do is go into the San Luis meat market door (northeast corner of the building) and go to the counter closest to Harding Pl and order your prepared Grilled Chicken. The aroma in the car will make your mouth water. If you want to grill the chicken yourself, I have no idea what spices San Luis uses, so I can't help with that, but I am sure home grilled chicken with S&P, garlic, paprika, annato, and ancho and other appropriate spices will suffice for the seasoning. 2. Go to either Cool Springs or Nashville Whole Foods and go to the fridge section where there are guacs, salsas, and now this Zocalo mole. Zocalo is a little restaurant in Atlanta owned by the Martinez family, and they make their own salsas and red mole. The red mole takes half a day, about 12 hours to make. It has a variety of fruit, seeds and chili peppers in it, producing a really complex and lovely sweet, heat, umami, and earthy flavor. 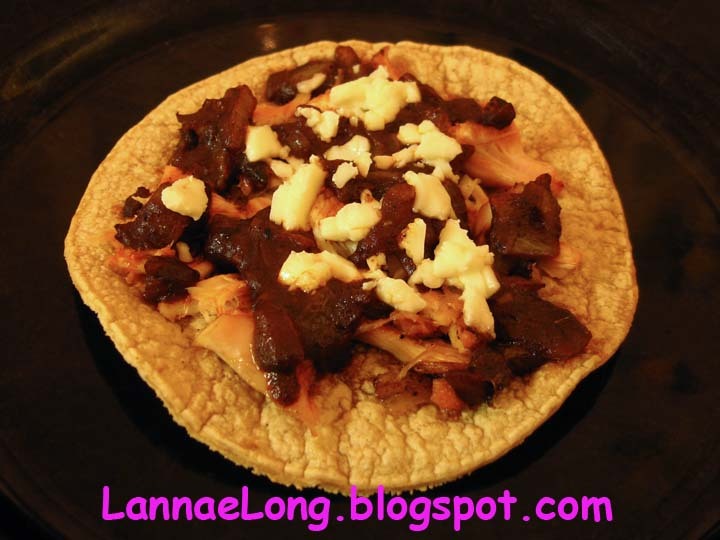 This is the best mole I have tasted since coming back from Mexico 5 years ago. There is no good mole I have tasted in Nashville until now. Zocalo Salsa brand red mole is not distributed widely, only in Atlanta, and now the 2 Whole Food stores in the Nashville area. Zocalo THANK YOU! 3. Invest time in getting good fresh tortillas in this town. There are stores in Nashville including La Hacienda and Dona Mari which makes fresh corn tortillas everyday. They are usually in a blue or red cooler, a stack wrapped in paper, and they are usually still warm. The flavor and texture of these tortillas will reward your taste buds. Do not get those pre-packed, shelf stable ones from conventional grocery stores because the taste and texture will make you frown. 4. The crema needs to be Crema Agria with a sodium content of 60 - 80 mg per serving. Do not use conventional grocery store sour cream or Greek yogurt because those two are not the right consistency and are too acrid for this dish. The only acceptable crema would be the one you make at home starting with whole cream. 5. The cotija cheese is a semi-stiff white cheese good for crumbling like a nabsuli cheese. I would try to find cotija for this dish, and can be found in any fridge section at any Mexican market. I would not use highly flavored cheese like jack, cheddar, or romano, as this dish is more delicate than that. Will Uhlhorn, is Co-Owner and Executive Chef at Table 3. I have been a fan of Will Uhlhorn for years when he was executive chef at F Scotts. As a matter of fact, when the Nashville Scene asked me what my favorite meal in a restaurant in the whole world and time on this earth was, without thinking, I blurted out the lobster ravioli at F Scotts created by Will Uhlhorn. I can vision it. My mouth waters when I think of the flavor, aroma and texture. It was a house made ravioli dish with big chunks of lobster in each ravioli, appropriately covered with a saffron cream sauce, and an added big pile of lobster meat, carefully removed from the shell, in the center of the white square plate. It has been years since F Scotts has made this dish because they usually don't repeat. I still think about this dish and would love to have it again. Hint Hint Will, Lobster Ravioli! I also love that Will Uhlhorn taught me how to make butter from farm fresh cream. So, after Table 3 reopened after the fire, it was high on my list to eat food created by one of my favorite chefs, Will Uhlhorn. The gig at Table 3 is to use many local and local organic ingredients and cook in a French country tradition. The food preparation seems like it was inspired by Burgundy farmland and European cooking. There are cheese plates, charcuterie, frisee, lardon, and stews that are very much of a French farm tradition. The plates are not quite like those we had in Burgundy and Champagne, rather there is some adaptation for the USA and TN expectation of dinner. A staple on the charcuterie menu is pate de campagne, country pate. One lunch time I was there, I had the charcuterie plate for lunch. 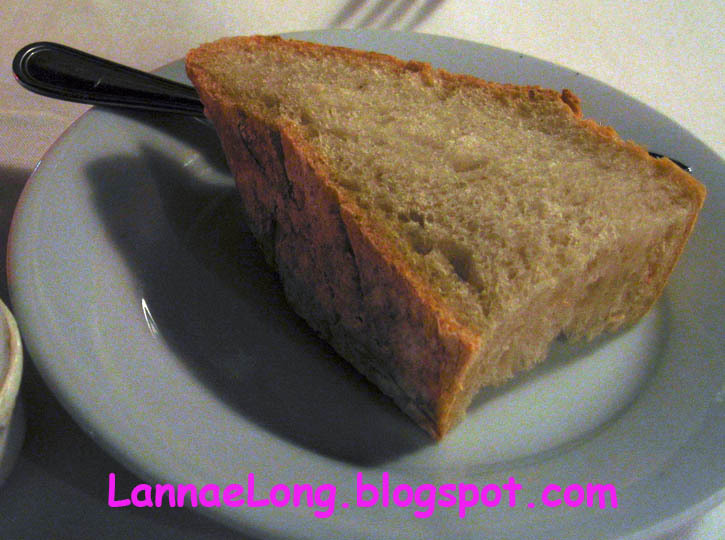 the country pate was made from local free ranged lamb. 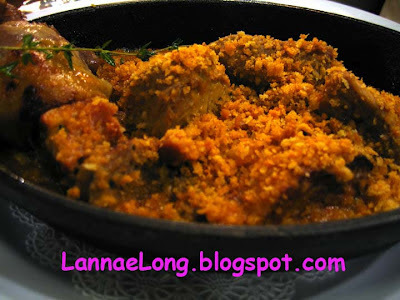 I have never had lamb pate before, and it was just so rich and flavorful, that I hope to have it again. All the charcuterie when I was there is made in house. There is no bad food distributor sausage here! One of my favorite meals that I had in Lemont France was a simple salad made with smoked gizzards, baby lettuce greens and farm egg. I have never had a salad come close to the Lemont salad, but Table 3 does a really good facsimile to the Lemont Salad. This frisee salad with Benton's bacon and farm egg is good. 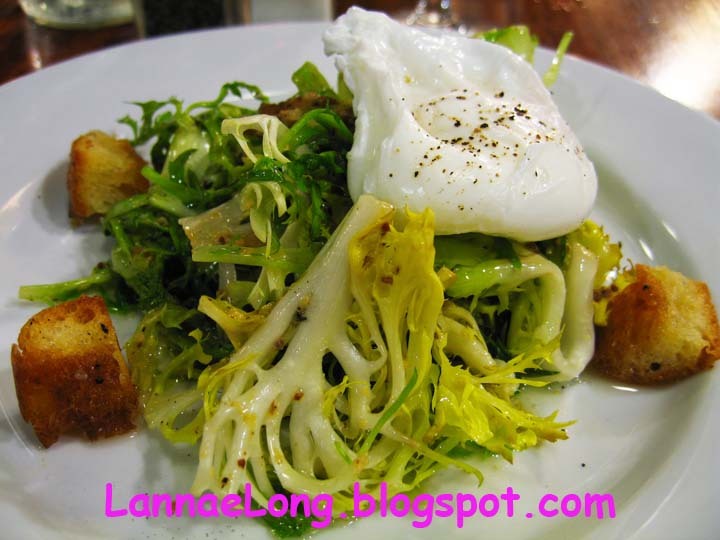 I love the poached egg with oozy yolk adding to a richness to the salad greens. Since my egg skills are lacking, I am unable to make a salad like this at home. Eh, why should I make it at home when I can get a really nice salad at Table 3. I got the daily special Scallops. The preparation was nicely seared scallops on top of sweet squash risotto with a nice lemon oil sauce. The lemon oil sauce has a really awesome quick of bright acid and truly added to the enjoyment of the scallops. As they always say on Top Chef, the seafood dish would have been better with some acid. Well, Will Uhlhorn obviously knows that, and I just loved the acid with the scallop. OK, so yeah, Table 3 is in a tough location at the mall. There are a lot of people like me who dislike the mall traffic, and actively avoid mall traffic. Table 3 is good enough for me to fight those Green Hills SUVs in the mall parking lot driveway while driving my 12 year old dented little 4-cylinder car. I took an oyster cooking class with Laura Wilson at the Grow Local Kitchen located in the main house at the Nashville Farmer's Market. Chris from the Louisiana Seafood Company, provided all the oysters for the class, and he spent the whole evening teaching shucking. I learned how to shuck oysters, make good dipping sauces for oysters, make really awesome oysters rockefeller, and oyster stew. I had oyster stew in Boston and it is very expensive in restaurants. 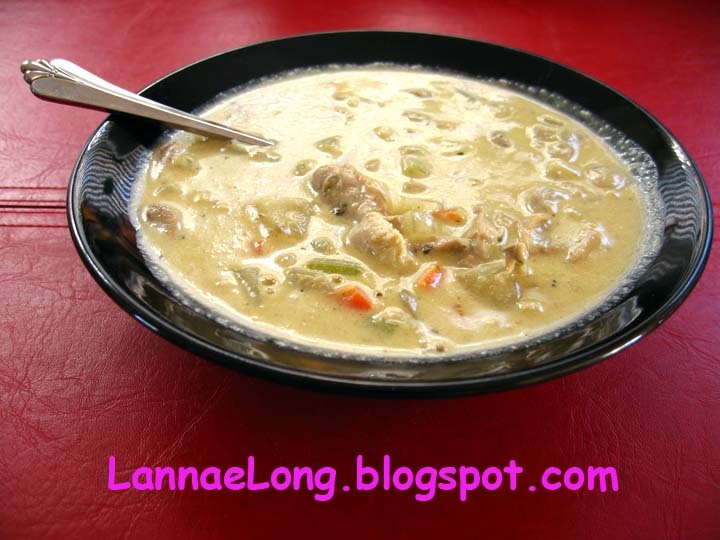 Most of the time I had oyster stew in restaurants, it was way too salty or I never felt like it was worth it. I have never had oyster stew made fresh in front of me, and never by my favorite chef Laura Wilson. Let me tell you, fresh oyster stew is certainly worth it. I love this oyster stew. It is so good! R U Gonna Eat Your Tots? 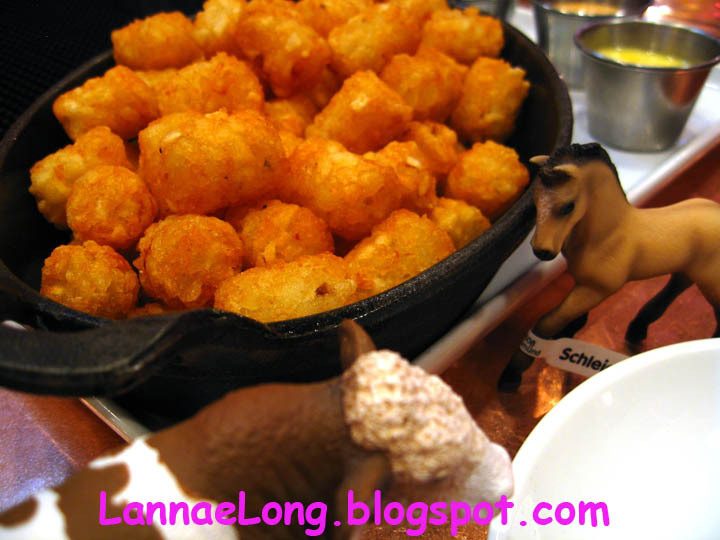 After watching Napoleon Dynamite, I renewed my interest in tator tots. The seen is that Napoleon asks Pedro if he is gonna eat his tots, and then Napoleon puts the tots in his cargo pants pocket for later. Then, in class, Napoleon pulls out a tot to snack on. Time after time watching Napoleon Dynamite, I want tots. Luckily, there is the most uber rendition of tots available in Nashville, and that is at Merchants Bistro Bar at 4th and Broadway. These tots are deep fried in duck fat and served with a spicy mayo, a bearnaise and ketchup. These tots are available 7 days per week in the bistro. The perfect sauce for these tots are to mix a little spicy mayo with a little ketchup. Each order is a big heaping mound of these things, and is probably enough for 4 - 6 people. There are a lot of tots. This is our pal Chris' suggestion for Merchants: get tickets for the Nashville Symphony. Get complimentary valet parking at Merchants. Go to Merchants for rocking drinks, share and order of tator tots, and everyone gets an entree. Finish dinner and go enjoy the Symphony. Come back to Merchants, and have another round of tots and a night cap before retrieving the car from the valet. Now that is a good night. This was my first trip to Charleston, SC, and I hope it is not my last. I fell in love with Charleston. Charleston isn't a large city, perhaps 120K residents in Charleston and 300K in the greater Charleston area. The airport is anything but hectic with its 10 gates total. And finally, Southwest flies to Charleston. There is hardly any traffic in Charleston. Getting in and out of Charleston is just a pleasure. Charleston's collective persona has a nice level of Southern hospitality with a layer of laid-back beach culture. The food in Charleston is some of the best food I have ever had. 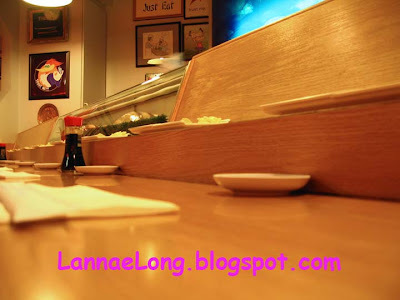 The expectation of ingredients in Charleston is that they are fresh and good quality, and there is a sense of pride in the freshness and good preparation of food at all levels of food from Chinese takeout to sit-down local organic. I did not get to explore the history, symphony, gardens or beaches on this trip, and I those are on my list for my next trip to SC. I am sitting here all starry-eyed remembering how awesome Charleston, SC is, and that I could live there. On this trip all the meals I had from a quick grab-n-go breakfast to dinner at FIG were well made. There are so many restaurants in Charleston that prides themselves on excellent preparation, and never serving pre-packaged food distributor yucky stuff, that it was tough to choose dinner options. To match my desire to eat locally and seasonally where ever I go, I opted to have dinner at FIG, Food Is Good in downtown Charleston. FIG's chef is James Beard Award Winner Mike Lata who believes in local, seasonal and farm to table cooking, and that is right down my alley. Mike Lata is also from MA, where I consider my home state. Mike Lata grew up in Western MA, where parts of W MA is quite an agrarian society and a local organic way of life. Mike Lata also made his way to Boston, Martha's Vineyard and Burgogne France where all of these areas have a tradition of local ingredients and well prepared meals. I too have lived in W MA, Boston, and adore visiting Martha's Vineyard and Burgogne, and these places all have food traditions I crave, and Mike Lata is the chef to deliver. Our meal was so good, and it will be one of those meals I will think about for years to come, or until I can make it back to Charleston and be lucky enough to have a seat at FIG again. 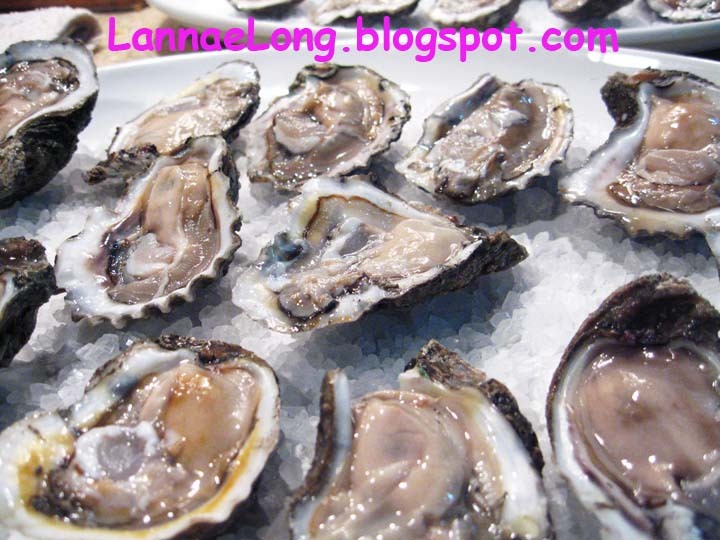 We started with raw regional dishes, one was a locally ranched Waygu beef tartar, and the other was the razor oysters simply served with a light vinegar pepper sauce. The tartar was served with a construction-paper thin potato crisp to add crunch and a little salt to the smooth delicate tartar. Wonderful. 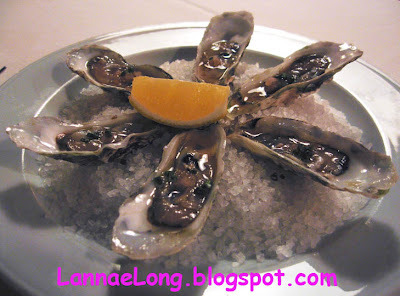 The oysters were a variety I have never had before, and were refreshing with the mignonette and a light squeeze of lemon. We opted for seafood for our entrees. Being landlocked by 7 states, it is really hard to find decent seafood in Nashville, so any opportunity I get going seaside, I will opt for seafood. We got the fish and shrimp stew and a baked snapper. The fish and shrimp stew was in a rich broth over Carolina rice. The rice served by FIG is grown in the USA, not Asia. The snapper was served over a really silky potato puree and garnished with a confetti of diced winter veggies and a light creamy sauces. The seafood was cooked perfectly, not over done, nor underdone. The word of the the night was Wonderful after each bite. Sushi Nozawa officially served its last nigri on Febrary 29, 2012 because Mr Nozawa, a man who has worked all his life, and at Sushi Nozawa for 25 years, wants to retire. His kids have started Sugarfish, a new sushi adventure in various locations in the greater West L.A. area. Sushi Nozawa was a plain dining room in a plain strip of stores on Ventura Blvd. There was no menu when I ate here a couple weeks ago, it is all omakase, chef's choice only. We waited in line this last time because Nozawa fans were there hoping to get their last tastes of Nozawa sushi before Mr Nozawa retires at the end of Feb 2012. We went with friends who are old veteran and trusted customers of Nozawa. This was helpful because by association, we got the good stuff, the stuff you don't get on the 1st few visits. Also, this was very helpful to know veterans because there are some rules about eating at Nozawa, no cell phones, no photos, no distractions, just sushi and sashimi. People have been kicked out of the restaurant for taking too much time and talking on a cell phone. I gotta say, a cell phone free dining room was actually refreshing and nice. To take these photos I have posted, I had to take them under cover and quickly, as to not be a victim of the kick-out. How Mr Nozawa worked is that newbies get fairly ordinary sushi and sashimi like tuna, salmon, yellowtail, veggies and the like. I am guessing Mr Nozawa did not want to scare away new customers by grossing them out by serving them unusual fish organs or fish eyeballs right off the bat. Because we went with returning and trust customers, Mr Nozawa served us some sushi and fish parts we cannot get in Nashville. My favorites were toro, lump crab, lobster, monk fish liver and abalone. Sadly, it is nearly impossible to get toro in Nashville. Toro is the belly ham of the tuna, and it is buttery, and smooth. It costs a lot, and in Nashville it is not considered a good value compared to other more filling and inexpensive rolls like California rolls. So, I was excited to be able to get toro while in L.A. I also enjoyed the crab and lobster sushi hand rolls. The rolls were overflowing with lump crab and lobster meat that I did not have to work to crack out of the shell myself. There was no fake krab-stick in this sushi (which is the only stuff you can get in most Nashville sushi joints). One that I really liked a lot because of the rich texture and flavor was the monkfish liver. Monkfish, when I was a kid, was the "junk" fish or the poor man's lobster because of the striation of the flesh and denseness of fish. Now, because of over fishing of the poor man's lobster, monkfish is no longer cheap, no longer sustainably fished, and has been seen to cost more per pound than lobster in the New England states. I have never had monkfish nor other fish liver before, and it was truly a treat. The last piece of sashimi I had at Nozawa was abalone. When I was a kid, my mom would make abalone as one dish for dinner when very special guests were invited to our house. 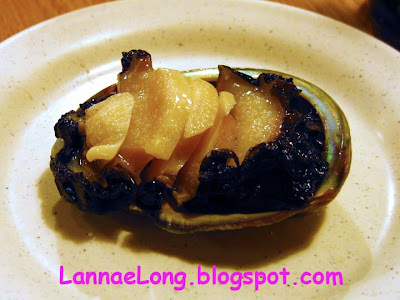 Abalone was considered a luxury in my home. We had some abalone shells in the house as well, as key holder dishes, and little knick-knack dishes. Abalone was one of my favorite seafoods that graced my plate once every few years. As an adult, I have not had abalone. On one occasion in Nashville, one retail outlet tried to pass off canned conch for canned abalone at $90 per 5 oz. Conch is ok, I do not love conch, and it is certainly not abalone. So, it has been about 20 years since I have tasted my beloved seafood, abalone. This abalone served at Nozawa was straight forward unadulterated abalone. I ate it slowly to enjoy the texture and flavor. Thank you Mr Nozawa, I hope your kids can carry on the tradition. UPDATE: According to the Sugarfish newsletter, the Studio City location will be renovated and will reopen as a Sugarfish. Stay tuned.